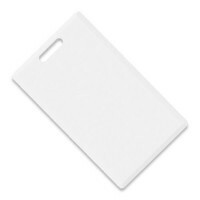 IL-05 Clamshell card ("thick") is the most simple, common and cheap proximity card for access control systems. The card has a slot to be worn on a lace, it protected against electromagnetic fields and static electricity. Personalization is done by sticker cards or by pouches and further lamination.